Now that we’re past Thanksgiving, it’s officially OK to look toward December holidays, right? This past weekend, Turkey Day behind us but plenty of leftovers still in the fridge, our son Dash had us unpacking all the Christmas decorations and putting up the tree—carols blasting at full volume. And my wife Tara and I broke out an anthology of Christmas mysteries too. ’Tis the season, after all! All that in mind, I’m glad to welcome my good friend Shawn Reilly Simmons to the First Two Pages, celebrating her new novel, Murder With All the Trimmings, the sixth book in her Red Carpet Catering Mystery series—this one with caterer Penelope Sutherland home for the holidays and investigating the death of one of the Big Apple Dancers on the eve of the annual Christmas Extravaganza. Can the holidays be saved? Shawn and I first met at the annual Malice Domestic convention, which Shawn helps to organize and run—so smoothly always!—and we’ve been friends for many years, bonding over our love of mysteries, celebrating one another’s successes, and sharing stories about parenting young boys: our Dash just a bit younger than Shawn’s son Russell. And speaking of Dash, I’ll never forget his first visit to Malice, when Shawn presented him with a little welcome bag full of fun toys—brightening his day and ours as well. 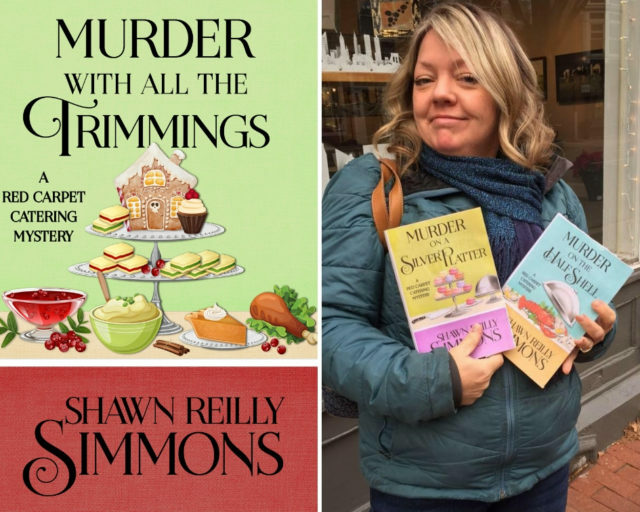 Dash, Tara, Tara’s mom Ann, and I braved the elements to attend Shawn’s launch party when Henery Press published the first two Red Carpet Catering books—Murder on a Silver Platter and Murder on the Half Shell. All of us have been thrilled with how the series has progressed since then. And I’m constantly amazed at how Shawn does all she does: writing, parenting, Malice Domestic, and her latest role as one of the editors at Level Best Books too! In the essay here, Shawn offers a glimpse at Murder With All the Trimmings. No better way to kick off the holidays!